Overriding objections from Republicans and Democrats alike, President Bush endorsed the takeover of shipping operations at six major U.S. seaports by a state-owned business in the United Arab Emirates. He pledged to veto efforts in Congress to block the agreement. The president on Tuesday defended his administration's approval of the sale of London-based Peninsular and Oriental Steam Navigation Co. to Dubai Ports World despite concerns in Congress that it would increase the possibility of terrorism at American ports. Mr. Bush and Republican leaders like Senate Majority Leader Bill Frist and House Speaker Dennis Hastert are not walking lockstep on this one, reports CBS News White House correspondent Jim Axelrod. The transaction will allow Dubai Ports World to run major commercial port operations in New York, New Jersey, Baltimore, New Orleans, Miami and Philadelphia. "If there was any chance that this transaction would jeopardize the security of the United States, it would not go forward," Mr. Bush said. "I want those who are questioning it to step up and explain why all of a sudden a Middle Eastern company is held to a different standard than a Great British company," Mr. Bush said. "I am trying to conduct foreign policy now by saying to the people of the world, 'We'll treat you fairly.'" Mr. Bush sought to quiet a political storm that has united Republican governors and Frist with liberal Democrats including Sens. Hillary Rodham Clinton and Charles Schumer. Frist said Tuesday, before Mr. Bush's comments, that the pending sale raised "serious questions regarding the safety and security of our homeland." Hastert, asked the president for a moratorium on the sale until it could be studied further. "We must not allow the possibility of compromising our national security due to lack of review or oversight by the federal government," Hastert said. Rep. Peter King, R-N.Y., speaks for many on Capitol Hill when he pointed out that two of the 911 hijackers were from the United Arab Emirates, Axelrod reports. Maryland Gov. Robert Ehrlich, during a tour of Baltimore's port on Tuesday, called the deal an "overly secretive process at the federal level." Frist, R-Tenn., threatened to introduce legislation to put the sale on hold if the White House did not delay the takeover. Mr. Bush took the rare step of calling reporters to his conference room on Air Force One after returning from a speech in Colorado. He also stopped to talk before television cameras after he returned to the White House. "I can understand why some in Congress have raised questions about whether or not our country will be less secure as a result of this transaction," the president said. "But they need to know that our government has looked at this issue and looked at it carefully." At the same time, a senior executive from Dubai Ports World pledged the company would agree to whatever security precautions the U.S. government demanded to salvage the deal. Chief operating officer Edward "Ted" H. Bilkey promised Dubai Ports "will fully cooperate in putting into place whatever is necessary to protect the terminals." Bilkey traveled to Washington in an effort to defuse the growing controversy. 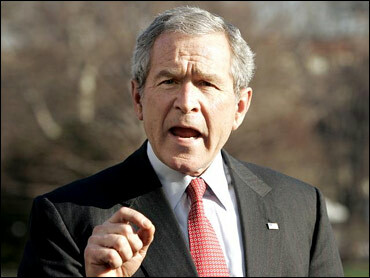 Mr. Bush said that protesting lawmakers should understand his approval of the deal was final. "They ought to listen to what I have to say about this," the president said. "They'll look at the facts and understand the consequences of what they're going to do. But if they pass a law, I'll deal with it with a veto." Critics say the screening of cargo relies too much on trust. U.S. Customs officials do review manifests in 42 foreign countries before the freight is shipped. But, truck-sized X-rays and radiation detectors are only used to scan the most suspicious containers, reports CBS News correspondent Bob Orr. "This is a company that has played by the rules, has been cooperative with the United States, from a country that's an ally on the war on terror, and it would send a terrible signal to friends and allies not to let this transaction go through." Lawmakers from both parties have noted that some of the Sept. 11 hijackers used the United Arab Emirates as an operational and financial base. In addition, critics contend the UAE was an important transfer point for shipments of smuggled nuclear components sent to Iran, North Korea and Libya by a Pakistani scientist. They say a port operator complicit in smuggling or terrorism could manipulate manifests and other records to frustrate Homeland Security's already limited scrutiny of shipping containers and slip contraband past U.S. Customs inspectors. Rep. King and Democratic Sen. Schumer said Tuesday they would introduce emergency legislation to suspend the ports deal. King, chairman of the Homeland Security Committee, said the government "cannot consider approving this contract until a much more thorough investigation takes place on this security matter." Sen. Susan Collins, R-Maine, and Rep. Jane Harman, D-Calif., said they would introduce a "joint resolution of disapproval" when they returned to Washington next week. Collins heads the Senate Homeland Security and Governmental Affairs Committee, and Harman is the top Democrat on the House Intelligence Committee. Frist said Congress should have veto authority over such foreign sales, which are reviewed by a secretive U.S. panel that considers security risks of foreign companies buying or investing in American industry. The panel includes representatives from the departments of Treasury, Defense, Justice, Commerce, State and Homeland Security. Defense Secretary Donald Rumsfeld described the United Arab Emirates as a close ally. "It's a country that's been involved in the global war on terror with us," Rumsfeld said. He added that the United States and the UAE "have very close military-to-miltary relations, as well as political and economic relations." Separately, Attorney General Alberto Gonzales said port security would not be threatened. "This is not a question about port security," Gonzales said. "This is a question about port operation."